Oh brave new world! Where transparency reigns. Banking Technology’s team often gets asked: with so many challenger banks on the UK scene, which ones are likely to succeed? To this the answer starts with a question: what do you define as a success? If a challenger bank was set up with the goal of making a quick buck – i.e. to make enough noise in the market to attract a larger player and sell off for a profit – that’s one thing. If a challenger bank is in it for the long haul and has a long-term strategy, then it’s another. So, for the latter I believe the success largely depends on finding the right niche/target market and the right solution to fix an existing problem. Good examples here are Aldermore Bank and Shawbrook Bank – both were among the first to tap into the greatly underserved SME banking market and offer a viable financial alternative for the SME sector that has been – let’s be honest – very badly treated by the big high-street banks. Oaknorth Bank has since joined the fray, as has SME banking service Tide. Another noteworthy example is Metro Bank. The bank offers both consumer and business banking accounts, has a strong digital proposition (which it has been building up over the last couple of years) combined with a network of brick-and-mortar branches (which offers extended hours service, including weekends) and the ability to get a physical card and start banking there and then, upon opening an account. Metro Bank has now also become a direct participant of Faster Payments, the UK’s 24×7 real-time payment service. The result? Metro Bank has doubled its quarterly profit in Q2 2017, enrolled over one million customers, is expanding its branch network outside London and is on track to record its first full-year profit since its inception in 2010. And then there is a bank for banks, financial institutions and fintechs – ClearBank – the UK’s first new clearing bank in 250 years. It has become the fifth clearing bank (that offers agency banking, i.e. clearing services to other banks), alongside banking behemoths such as Barclays, HSBC, Lloyds and RBS, and is the only one that does not offer retail banking services. This enables ClearBank to “offer a truly neutral and independent banking service to the financial services market” and not compete with its own clients, says its founder Nick Ogden. With some 50 hopefuls in the UK waiting for regulatory approval, it surely won’t be dull! All about Swift’s gpi (including Ripple’s criticism). How banks can get closer to their small business customers. Common Reporting Standard (CRS) – a year on. Square wants to be a bank, sort of. “You fight like you train.” US Army General George Patton. Passive data donor or proactive data seeker? Driving – and commercialising – innovative and truly added-value concepts. 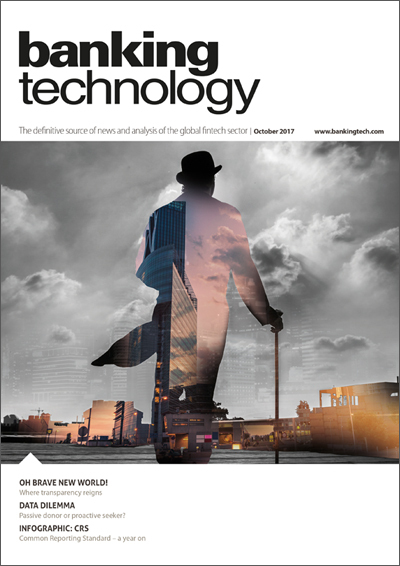 Click here to read the digital edition of Banking Technology October 2017. UK-based challenger bank Shawbrook has launched a new lending platform for the motor finance marketplace, powered by Cognition Direct, a direct-to-customer loan decisioning engine from Redline. Those UK challengers are up to something. For the management of business-critical spreadsheets. Known telecommunications vulnerability exploited to target bank accounts.